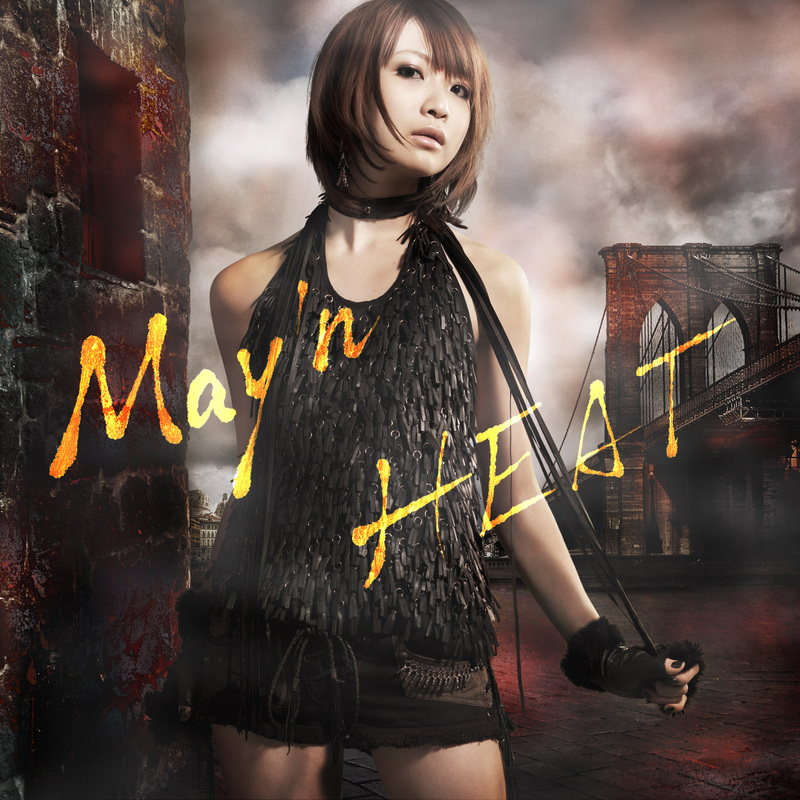 J-pop singer May’n, best known in the anime/manga community for being the singing voice of Macross Frontier‘s Sheryl Nome, releases her newest album “Heat” today in Japan. While two of the numbers on the disc are anime OP/EDs, and one from a new Kamen Rider drama, the other nine songs on the album are original tracks written by a bevy of lyricists and composers—including May’n herself, who wrote music and lyrics to two tracks. The songs range in genres from mid-tempo rock, piano-driven ballad, and chirpy dance music, with the one constant being May’n’s forceful melisma-laced voice on every track. May’n’s voice in large part will determine whether one enjoys the album. At its best, it carries a sense of urgency and power that brought songs like “Don’t Be Late” and this new album’s Phi Brain OP “Brain Driver” and “Heat of the Moment” to life. It is particularly well-suited for driving dance numbers like the Aria: The Scarlet Ammo OP, “Scarlet Ballet,” or the rock-oriented original track “Get Tough.” It is less effective on songs that require some delicacy, or at least a pulling back of her melisma. She tries her best in the more ballad or mid-tempo tracks like “Kagami” and “Koi,” and partly succeeds in controlling it there, but other songs like her own “We Are” feel a bit oversung. The album closes with perhaps the most unusual song in the collection, Shiro Sagisu‘s (Evangelion, Kare Kano) “Jewels.” Sagisu’s trademark use of strings fills in a bombastic, power chord heavy epic abounding with guitar fills and solos. May’n’s singing style might seem to fit such an arrangement, but the 6.5 minute track begins to wander by the song’s second half. This is not a style of music, however, that is typically broached in J-pop and while imperfect it widens the musical breadth of an otherwise fairly conventional album. Like many pop albums, “Heat” is a mixed bag with both standout numbers and filler tracks. It necessarily lacks the singular musical vision and consistency that, say, a soundtrack by Yoko Kanno would have, but that is an unfair comparison. Unlike Maaya Sakamoto in her early career, May’n has never been simply beholden to a single composer’s vision, and with the variety of musical styles and self-written compositions, she is trying to forge her own musical direction. Whether she has found it yet remains to be seen, but there are enough strong tracks to remind listeners of her talents as a singer and performer. I’m biased and after seeing her covering “Eternal Blaze”, I’d say that she has the potential to do better; it’s just the writers and composers can’t get it right for her. Bring Yoko Kanno back! She has trouble hitting the high notes if they come suddenly, but with Macross Songs, they came gradually and she was able to adjust to that. diamond crevasse was pretty much a good example of her range. guess i’ll give this album a try. mamegu’s 2nd solo album came out a week or two ago, too. they’re in sync finally lol. @ omo – Diamond Crevasse is one of her best slow songs that was totally written for her voice. If she were to sing more slow songs, I think she needs to head toward that direction.